Last Saturday we headed south on 79 to Peters Township because I had a hair appointment. Two hours later, with newly brown hair and a lot less hair (which was somewhat unintentional and I regretted the decision to chop it off even as the first chops were made but at least it'll be cool for summer and it requires a lot less shampoo/conditioner), I emerged hungry. We had planned to have lunch at La Bella Bean in Bridgeville. 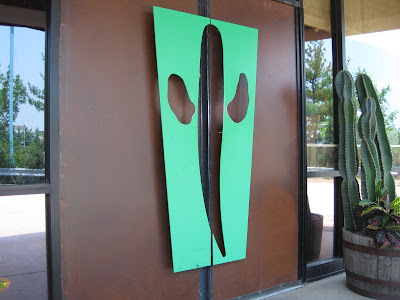 Unfortunately, when we got near that block of Route 50 in Bridgeville, we discovered it was blocked off because of Bridgeville Community Day (or something like that), so we were frustrated (hot & hungry) and disappointed (I've been wanting to try more than coffee at La Bella Bean). Parking looked difficult and far away. The next closest places were in Green Tree/Mt. Lebanon, so we set off for Scott Towne Center. I let SP choose between Tamarind (Indian) and Mad Mex (Mexican) -- since I am not a huge fan of Indian/Mexican, but he is, I was trying to be a nice wife since he took me to get my hair done and sat in the salon for 2 hours, subjected to women gossiping and all that hair product smell. He chose Tamarind, with the understanding that I would order off the menu, not eat the lunch buffet, which doesn't have much Yum Yum friendly food besides the na'an and really, $10 for na'an? But of course they said no menu, buffet only. SP was really, really sad because he loves Indian and hasn't been there in ages, but he also knows that the buffet is a waste for me. So we left and went two doors down to Mad Mex. I told him we could go to Tamarind for dinner some night this summer (he looked really, really sad after being so close to those stinky, spicy dishes and then not being able to partake). We were seated right away - they were not very busy around noon on Saturday. We ate inside, not out on the deck, because it was rather hot and humid. We both ordered iced tea - and it was fresh brewed, not from a mix! 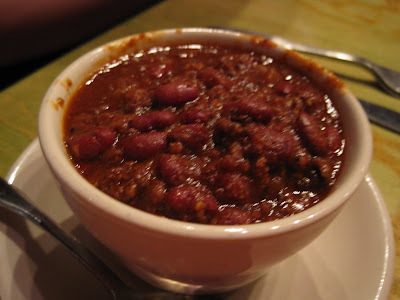 SP started with the Red Bean Turkey Chili: He always enjoys this chili; I didn't try any. 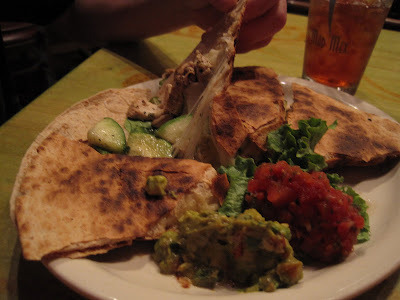 For his main lunch meal, SP chose the Red Velvet Quesadilla - "a voluptuous dish with delectable chicken, spicy spinach, pico de gallo, tempting zucchini and silky cheese." I am not really sure what made this 'red velvet' but he enjoyed it. He chose the whole wheat tortilla. I thought the chicken was a bit dry and the zucchini a bit undercooked but it was OK. I liked mine a lot more. 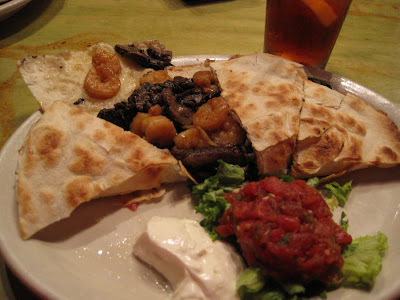 I chose the Shrimp-Mushroom-Spinach Quesadilla: I really enjoyed this. I like the tortilla a lot - white, of course, and it was nice and crispy. We each took home one wedge of quesadilla. A nice lunch - we felt re-fueled and ready to tackle the afternoon! 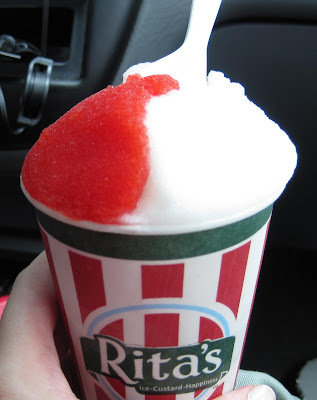 After a couple of errands in the area, we found ourselves drawn to the Rita's across from the Mad Mex. 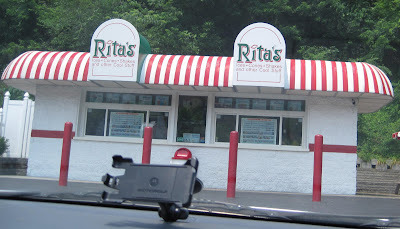 I had a coupon for Rita's, and it was a very hot day, so we stopped in for a treat. 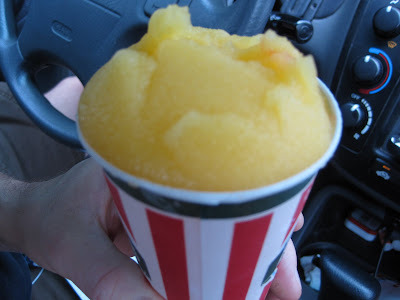 SP chose mango ice: And I had a swirl of cherry & lemon: I think lemon & mango remain my favorite Rita's flavors. The cherry was OK, but it was that red cherry; the black cherry is much tastier. We ate them on our drive home, but my tongue and lips got so darn cold that I couldn't finish the last few bites! Rita's mango ice is definitely my fave!